Highlight: Scored his first goal for the club against ES Setif in the Club World Cup 17/12/2014. 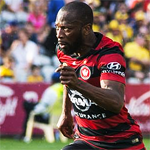 Highlight: Scored his first goal in the A-League against Brisbane Roar on 25/3/2015. Highlight: Scored a hat-trick in the 2015/16 Semi-Final against Brisbane Roar. Description: Romeo Castelen is a winger who made an impact on the Dutch football scene in the early 2000's, having broken through at Den Haag & giants Feyenoord, he gained 10 caps for the Dutch national side before a barrage of injuries forced him to spend half a decade on the sideline. His first season for the Wanderers was punctuated by another wave of injuries, despite this he managed 5 goals in 23 games. That's the look of a man who's just experienced Sydney airport customs for the first time. Wait till Vitor tells him how much parking costs. And then there is the $300 fine one of your brothers copped at a deserted bus stop in gosford after the March 2013 rain match. Someone in uniform though a blue thin line had been crossed. I trust Romeo is a non smoker though, and will travel on the team bus. It did indeed. It was effing disgraceful. It seemed as if the three police officers who surrounded him had finally found someone they could bully. 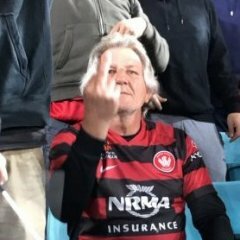 As I've said before, I've lost a great deal of respect for the force since I've been hanging out with WSW people, and it started back then in Gosford even before I turned active. From this interview he seems very grounded and professional, Hopefully that is shown on the Pitch as well. Liked to mention the Team alot as well. 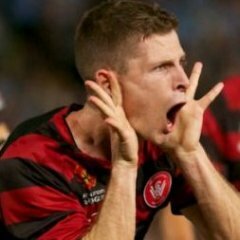 Castelen not registered for the acl??? I like that his name is pronounced Ro-mayo. So exotic. In a straight swap Castellen has taken Hersi's #17. In a straight upgrade Castellen has taken Hersi's #17. How about we see if he can score a goal before we start calling him an upgrade. So, in the absence of any further trial matches, the first time Romeo will be released on the pitch will be against the VIC in round 1. Should be good. If it is true that in his younger years he used to be considered in the same league as Robben then we all should be in for a treat. Can't wait to see him play, especially if he's supposed to be better than Hersi. Dislocated / fractured his thumb in the intraclub trial today. Shouldn't prevent him from training or playing once its treated & the swelling subsides. His ability to beat a man whilst dribbling is a sight to behold & his body positioning is a feature of his ball retention & defensive work. The left backs in the Aleague are going to have nightmares after being carved up by this guy. He's also likely to assume the role of corner / set piece taker. His ability to beat a man whilst dribbling is a sight to behold & his body positioning is a feature of his ball retention & defensive work. 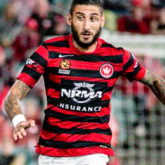 The left backs in the Aleague are going to have nightmares after bbeing carved up by this guy. Taurus' posts are the best on this whole forum. I seem to be repeating myself at regular intervals. Romeo > Daylight > Hersi. Sorry dude! So much to read on here n we' re all super duper excited!!! Better than Saba? Haven't rated his free kicks on goal but corners/deliveries in the box have been delicious! I have been reading posts by 'experts' on other forums that Romeo is 31 so he is over the hill and has played hardly any games so won't be an issue this season. 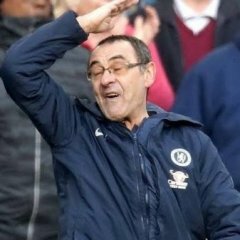 does he take short corners? He's a must for my Fox Fantasy team. Best value on the market. Only wish SFC still had MW playing LB coz the Derby would've been a comedy festival. Both Shannon & Vitor were on the opposing team today, so we have multiple options.